Veiled women pass a statue of Chairman Mao in Kashgar, Xinjiang Province, China the day after the July 30 stabbing death of the ancient Silk Road city’s chief imam. Ahmet raises a trembling hand to his face, taking off his glasses and wiping away tears. His voice quivers as he speaks, but not in sadness. He is afraid. Five days earlier, he was at his nephew’s house when security forces suddenly descended. The nephew had grown a beard. And in Xinjiang, the sprawling region that dominates China’s western flank and the locus of persistent civil strife, that’s often enough to put a man behind bars. The nephew was taken away, as were his wife and their daughter, not yet a year old. When Ahmet tried to intervene he, too, spent the night in a cell that was too small to let him lie down. Through the bars, he watched men with long sticks walk to where his nephew was being held – and for the next 20 hours heard the young man’s screams. The images accompanying this report are the work of award-winning Canadian photographer Kevin Frayer. Although beaten as well, Ahmet was released the next day. His nephew, whom he describes as devout but mild-mannered, was not – raising the fear that he could be locked away for a decade. But there is tremendous violence taking place on both sides. The bloodshed more than doubled the death toll from what had been – for two months – the worst act of terrorism ever committed on Chinese soil: 39 deaths May 22 at a market in the regional capital, Urumqi. Beijing has responded swiftly and forcibly, spurred by President Xi Jinping’s pledge during a visit to Xinjiang just three weeks earlier to “make terrorists like rats scurrying across a street.” Declaring its own “war on terror,” the government radically restricted expressions of faith – including a ban on fasting (which is essential to Ramadan). It also sent troops bearing assault rifles to street corners, mosques, airports, hospitals, schools and train stations across the region. Some Muslims, like many of Xinjiang’s ethnic Chinese residents, support the crackdown. They argue that an iron fist is necessary to maintain safety. The government’s conduct in Xinjiang also poses new questions for an international community that has largely muted its criticism of China’s contentious human-rights practices in exchange for a smoother path to lucrative trade. Are other nations, in the name of commerce, prepared to overlook China’s chokehold on the religious practice of millions of its own citizens? It’s an issue that Canada, having chided Beijing for its repressive policies only to pursue energy sales aggressively, may have to face in a particularly direct way: Xinjiang is a major centre for Chinese oil and gas, and at least one company based there has toured western Canada, looking for potential investments. Compared with the Audi-choked freeways and glass towers of Beijing, Xinjiang is a world apart. Urumqi is 3,000 kilometres – about the distance between Toronto and Medicine Hat – from the nation’s capital. Even when the first high-speed rail line reaches the region next year, bullet trains travelling at 300 km/h will take 12 hours to arrive from Beijing. Xinjiang is an isolated sprawl of mountains, grassy steppes and dune-strafed deserts, a place whose isolation from the rest of China is evident even in the time. Local Han people, who are ethnically Chinese, use standard Beijing time, as do airports and train stations. Uighurs, and their restaurants and hotels, operate two hours later, in keeping with their western location. On fundamental points of history, too, there is little agreement. Uighur historians point to evidence of their settlement that dates back millennia, when Xinjiang was a waypoint on the ancient Silk Road travelled by camels and elephants, while their Han Chinese counterparts emphasize the fact that it has spent centuries under Chinese rule. That the “Xinjiang Uighur Autonomous Region” is religiously and culturally unique, however, is beyond dispute. Islam arrived in the ninth century, largely displacing Buddhism. Today, many Uighurs are intellectually and linguistically oriented west toward Central Asia and the Middle East – watching Iranian music videos and reading Turkish news sites – rather than east toward coastal China. Their home territory has, however, experienced tremendous change since the Communist Revolution in 1949. Briefly an independent state in the early 20th century, Xinjiang has in the past few decades become home to vast numbers of ethnic Chinese, many of them sent here by government settlement policies. They now outnumber the Uighurs, and continue to arrive, drawn by untrammelled space and the jobs that flow from a land rich in resources. But the wealth hasn’t necessarily benefited the Uighur population. As the region’s oil and gas flow east, local filling stations routinely run short, with lineups 150 cars long. Xinjiang accounts for 28 per cent of China’s natural-gas reserves, which are being tapped at a roaring rate by a country eager to fuel its remarkable growth with its own energy. Between 2000 and 2012, gas output increased sixfold, while oil production rose by half. Some 60 per cent of Xinjiang’s gross domestic product is now derived from petroleum. And for all the jobs that development has brought, the region has China’s highest rate of unemployed college graduates – 80 per cent of them minorities, many of them Muslim. Job postings sometimes demand Han Chinese outright. A former manager at a large Western company in Urumqi says that, of 400 employees, only 10 were Uighur. I want a Starbucks so badly. Xinjiang should be like foreign countries, with more equal rights. Against this backdrop for the Uighur population – reduced to minority status in their homeland, often failing to get the best jobs, watching local wealth piped away – discontent has simmered. Protests have erupted, calling for everything from basic equality to outright separatism. At times the anger has turned violent: In 2009, a riot in Urumqi led to 200 deaths. Last October, a radical Uighur group, the Turkistan Islamic Party, claimed responsibility for a car explosion that killed five and injured 40 in Tiananmen Square – the heart of Beijing. 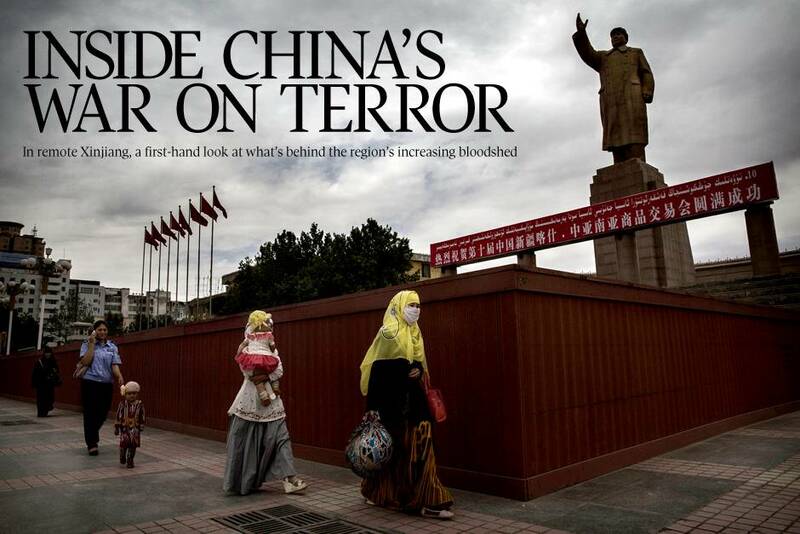 But the biggest shock for many in China came with the May attack in Urumqi. It was early on a Thursday morning, at one of the city’s busiest early markets. Li, a garbage truck driver (willing to disclose only his surname), was in bed when he heard screaming. He ran to his living-room window and saw two SUVs travelling side by side, progressing quite slowly – because they were driving on top of the shoppers crowding the street. “They were all old people – they were hit once and did not get back up,” he says. As the SUVs made their way, those inside also tossed explosives into the crowd. Then the vehicles suddenly came to a stop and burst into flames with a massive sound. “The first car exploding – I thought it was an earthquake,” one shopkeeper recalls. Mr. Li took photos of the aftermath on his cellphone, and says he heard dozens of explosions as 136 people were either killed or injured. The next day, China announced a one-year crackdown on “violent terrorist activities.” After the first month, officials reported having made more than 380 arrests, seizing 264 explosive devices and breaking up 32 terrorist gangs. Dozens of people accused of planning attacks have been executed, with hundreds more sent to jail. The crackdown has added to the weight many Uighurs already feel, pinned down by a state that sinks deeply into their daily lives – always watching and, in the name of stability and safety, stripping away the culture and religion that makes them distinctive. A broad reading of that statement has allowed Beijing to restrict the practice of Islam in Xinjiang. Local Muslims cannot wear traditional dress, grow their beards long or pray where and when they want to. Who and where the Koran can be read are also subject to state control. Across the street from one mosque in Urumqi, a pack of heavily armed soldiers glares out from a thick metal cage with a sign warning people to stay away. At another mosque, soldiers surround a hulking armoured personnel carrier pointed directly at a busy entrance; a steady strobe of flashes from a camera mounted above the street captures the licence plates of each passing car. Travel for Uighurs is difficult. In rural areas, locals need permission just to leave their villages. Roads are dotted with checkpoints, often minutes apart, where ID cards must be presented. Passports are almost impossible to obtain (unless an applicant can afford to pay a bribe as high as 300,000 renminbi, or $52,000). For most, travel to the Hajj is not worth attempting. In big cities, new airport-style security checks for bus travel are forcing even grandmothers to use taxis when shopping – milk cartons are over the limit for liquids. The entrance to one Uighur-owned hotel is covered by eight cameras, capturing every possible approach. People do what they can to evade the constant surveillance. Ahmet attended a recent meeting with businessmen who had traded their smartphones for cheap dumb ones, believing their movements and conversations were being monitored. When on the Internet, many Uighurs avoid making even innocuous references to their own history or poetry, for fear of angering the authorities. Rather than pushing Ahmet, a published author, away from his faith, though, the government stranglehold has driven him deeper into it. Sometimes, the next life seems too long to wait. In my understanding, [authorities] fear that, if Muslims read the Koran and build their knowledge, they will threaten the state’s power. But what Muslims need is freedom, not power. Alahagezhen is a small village south of Urumqi, less than 250 kilometres from China’s borders with Kyrgyzstan and Kazakhstan. It is home to a couple of cellphone stores, an electronics repair shop and several restaurants. For the rest of the world, it may as well not exist: A search on Google returns not a single English-language reference. It is in places like this, far from scrutiny, that China’s uglier practices sometimes take root. For years, Alahagezhen has been best known for its Tuesday bazaar, where local honey sells alongside spices and aphrodisiacs. Several weeks ago, that bazaar turned deadly, after a group of women, some of them still school age, came to shop in traditional attire, against China’s strict regulations. Their faces covered except for their eyes, they were detained by police. As more people joined the protest, soldiers were called in, according to a teacher with friends who saw what happened. “They warned people by shooting into the air, but the shots hit some high-voltage cables, which fell and killed two people,” he says, identifying himself only as Roch. That just made the crowd more angry, and soldiers opened fire, killing another three. The riot was confirmed by a local shopkeeper, who is Han Chinese and said it began when the police were “educating” the women, and “their families ... made trouble.” Today, a metal fence lines the road where the bazaar used to be. Similarly stark, if less visible, is the barrier China has built around Uighur children. Those under 18 are not allowed to attend mosque or study the Koran. “No teacher can participate in religious activities, instill religious thoughts in students or coerce students into religious activities,” reads a notice posted recently on a grade school’s website, according to the Associated Press. Ignoring the ban can have serious consequences: One of Roch’s former Islamic teachers has spent a decade in jail; another was detained in early June, along with his wife, and no one knows when or if they will return. Uighur students also are no longer free to study in their own tongue, a Turkic language written in the Arabic script. They must enroll in “bilingual” classes – where all the textbooks, except one for Uighur as a second language, are in Chinese only. One teacher says that, because the new curriculum does not allow for enough practice, “at least two to three students can’t write Uighur” in each of the first middle-school classes to use it. The teacher supports bilingual education. “Chinese is the national language” and, without it, career opportunities are limited. But seeing Uighur students unable to communicate properly in their own language “makes me very sad and very uncomfortable,” he says. Not far from Alahagezhen, the Subashi ruins stand like a sentinel of the past against the jagged Tianshan range. The adobe remnants of an ancient Buddhist temple date from the third century – ancient history China is happy to exploit to emphasize the area’s pre-Islamic past and links with long-ago dynasties. A short drive away, the point is further emphasized at a museum in an old palace that is still home to an elderly Uighur who is China’s last living minority prince. A sign there says that, by the mid-seventh century, the Han dynasty had established a military dominion over the region. Uighur history, and the establishment of Islam in the region centuries ago, is not mentioned. Instead, the museum displays a list of “18 Xinjiang Oddities,” such as: “Men love to wear flowery hats,” and “Beautiful jade dipped into alcohol makes alcohol better,” and “The names of locations on the ancient Silk Road are very odd.” The presentation offers a glimpse of an administration often prepared to trivialize Uighur people, or ignore them. It’s a policy with profound consequences, even among those who fit most closely into Beijing’s mould. On a small side street not far from Xinjiang University in Urumqi, a café sells hand-ground coffee, hand-formed hamburgers and pizza using hand-kneaded dough. The decor features the cover of Abbey Road, while Eminem, Adele and Michael Jackson rock from the speakers. The shop is run by a group of Uighurs in their twenties, who speak Chinese well – in many ways, just what central China wants to see. Fa Te is one of the owners. He surfs Instagram, rocks a mean beatbox and drinks beer with friends in his basement man-cave. He lusts for the outside world. “I want a Starbucks so badly,” he says. But that’s not all he wants. “Xinjiang should be like foreign countries, with more equal rights,” Mr. Fa says. Local authorities have begun to stop people who look Uighur on the street asking for identification. And yet, he, too, understands what might drive them to such extremes. Nathan VanderKlippe is The Globe and Mail’s correspondent in Beijing.